Palmetto Cheese drop biscuits are golden brown on the outside and soft, moist, and tangy on the inside. Easy and delicious!!! Photo and recipe from www.pimentocheese.com. 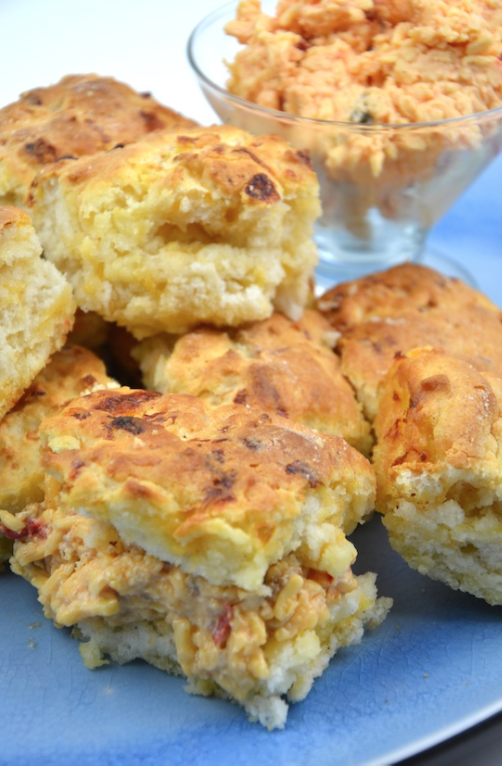 These savory cheesy drop biscuits are so easy to make. They can be whipped up in 30 minutes or less and are loaded with tangy cheesy flavor from the star ingredient~Palmetto Cheese. 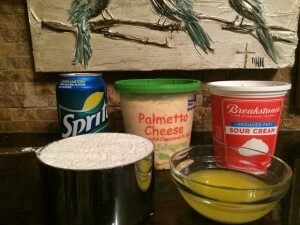 The ingredients used for these biscuits are ones that I always have on hand~Bisquick, Sprite, sour cream, butter, and Palmetto Cheese. Palmetto Cheese is our favorite pimento cheese. I keep a large Costco size container on hand at all times and use it for sandwiches, snacks, JalapeÃ±o Pimento Cheese cornbread, and these yummy drop biscuits. Any time I make these for drop biscuits for dinner, I refrigerate the leftovers for breakfast the next day. They reheat beautifully, wrapped lightly in foil, in an oven or toaster oven. They are wonderful stuffed with browned slices of Conecuh hickory sausage. 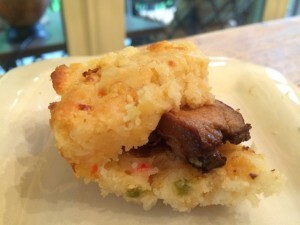 These biscuits are also wonderful filled with slices of seared Jamaican pork tenderloin (photo below). I’d love to hear from you if you try these, so please feel free to leave comments! Thanks so much for stopping by! Be blessed, and stay savvy!!! These yummy sour cream biscuits laden with jalapeÃ±o pimento cheese are easy to make and even easier to eat! In large bowl, place biscuit mix. Cut the sour cream into the biscuit mix with a pastry cutter or fork until crumbly. Pour melted butter into a 9-inch square pan. Put down plastic wrap or parchment paper on the counter. Sprinkle some of the biscuit mix onto the paper so the dough doesn't stick. Pat your dough out on the counter until it is about the same size as your pan. Cut the dough into shapes (I did squares). Place biscuits into the pan on top of the melted butter. Biscuits should be touching each other.